A new website called Facestat, enables you for free to upload a picture of yourself and have random individuals (what some call *crowd sourcing*) evaluate your photo for your trustworthiness. (They also guess your wealth, intelligence, age, martial status, ethnicity, weight, political orientation, state of drunkenness at time photo was taken, gender, attractiveness, and humorousness) Facestat uses an Amazon.com service called Mechanical Turk that hires individuals for a few cents per piece of work to evaluate a relatively easy task (Mechanical Turk was used to help map the surface of Mars and determine which were craters). They found that trust had noticeably fallen in formerly Communist, Eastern Europe, down to levels of Southern Europe (like Spain, Italy). Russia showed the highest levels of trust at 50% but its Eastern European neighbors had levels of trust between 42% and 48%. Crime: They also found a connection of trust with crime. “In countries with high levels of trust, people are generally less likely to say crime is a very big problem for their country (the correlation coefficient for responses to the two questions is -.56). Most of the countries surveyed fit the overall pattern, including the United States, where concerns about crime are about where one would expect, given the relatively high degree of social trust. Corruption: “[T]he relationship between trust and corruption resembles the one between trust and crime. The percentage of people rating corrupt political leaders as a very big problem tends to be lower in countries that have high levels of trust such as Sweden, Canada, and Britain (the correlation coefficient is -.54). On the other hand, in nations such as Nigeria and Lebanon, trust is rare and concerns about political corruption are widespread. Do people notice an art masterpiece on the street? I blogged earlier about the fascinating story of a world class violinist playing in the Washington Subway (“Pearls Before Breakfast: can one of the nation’s great musicians cut through the fog of a D.C. rush hour? Let’s find out” (Washington Post, 4/8/07, p. w10, Gene Weingarten) The story was indirectly about the cocoons that we live in such that 1000 commuters in Washington, DC, almost without exception, didn’t hear or stop to listen to the sublime beauty of violin virtuoso Joshua Bell who was busking in the Washington Metro as an experiment. One has to assume that these cocoons affect not only hearing Joshua Bell but also our ability to connect with friends and strangers. Now comes a related experiment. If you put up a world class painting (by Tuymans) on a pedestrian street in Antwerp (in Belgium) will people stop to notice it? The art experiment either also indicates the cocoons we live in, or indicates that we only recognize true ‘art’ when someone tells us it is art by hanging it in a museum. Robert D. Putnam and daughter Lara Putnam (historian at Pitt) comment on the kerfuffle regarding Barack Obama’s inartful description of poor whites being bitter and clinging to religion in response to their bleak economic circumstances. They note that, while much of the debate has focused on small town vs. big city respondents, the issues really relate to class gaps within the white community not city v. rural. As the Putnams note: “The real question is not ginned-up outrage over Barack Obama’s choice of words to describe the very real hardships facing many Americans in towns and cities of all sizes. The real question is whether his optimistic insistence that “Yes We Can” will resonate in those still-struggling Pennsylvania cities and towns that suffered a body blow with the loss of steel mills and factories a generation ago. Mr. Obama’s work as a community organizer on the streets of Chicago was predicated on the belief that even in communities beset by disinvestment, job loss and chronic frustration, self-confidence can be restored, collective bonds can be rebuilt and political efficacy regained.” They indicate that we’ll know soon enough if this message of hope resonates among white working class residents in these devastated PA communities. The Op-Ed, which appeared Sunday (4/20/08) in the Pittsburgh Post-Gazette, called “The Growing Class Gap” can be found here. 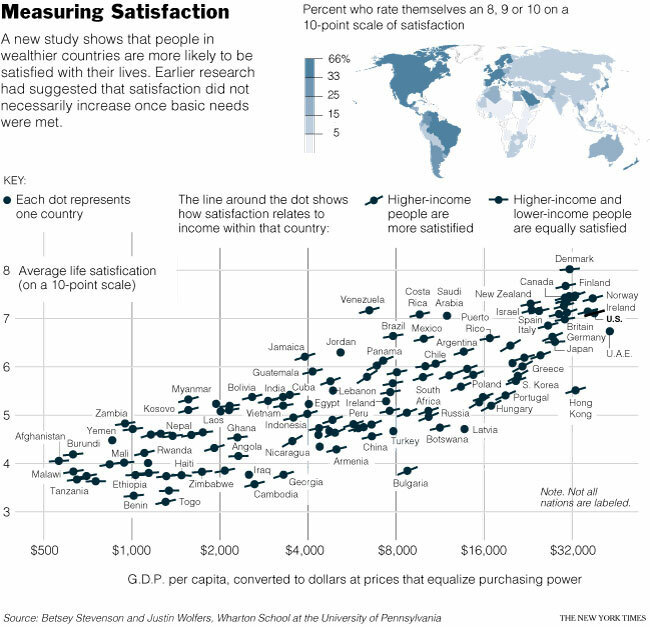 (d) they find little evidence for the “relative income hypothesis” (that happiness depends more on one’s income relative to others in one’s country or community than it does on absolute levels of income). Justin Wolfers is blogging about the paper at Freakonomics blog. There are to be several posts, but this is the first post. The paper is also summarized in today’s New York Times, featuring a nice graphic, The authors also discussed the research on CNBC (4/16/08). Earlier post on this subject available here discussing paper by Angus Deaton on this topic; Deaton’s conclusions were partially the same but he found a cut-off point beyond which economic growth did not lead to increases in happiness, perhaps because of the destabilizing impact of the growth.